Buy local this holiday season with the Tourism Windsor Essex Pelee Island W.E. Made It Gift Guide, in partnership with the Windsor-Essex Small Business Centre. The guide features ideas that are locally crafted and curated items that would make a perfect gift for someone that you care about this holiday season. It should make it easier for you to find local gift inspirations for everyone on your list! Get inspired – when you buy local, your money goes back to our community. There are so many unique items available locally, and your purchases help keep more money in our region this holiday season. Check out this weeks feature artisan, Tsunami Glassworks. Tsunami Glassworks creates fresh and modern blown glass sculpture, installations, decorative and functional objects. Their dedicated design team creates and fabricates glass products that reference sculpture as well as incorporate utility by combining organic forms with unique colours and a tactile finish. They create products with the idea of bringing art into daily life. The idea of creating scale through multiples is an important component to our products as they can be shown individually or clustered and grouped together to create a custom sculpture. Tsunami Glassworks mandate is to create high quality, gorgeous glass pieces all the while making their designers and craftspeople available to their clients; achieving balance between the art of glass design, and manufacturing. 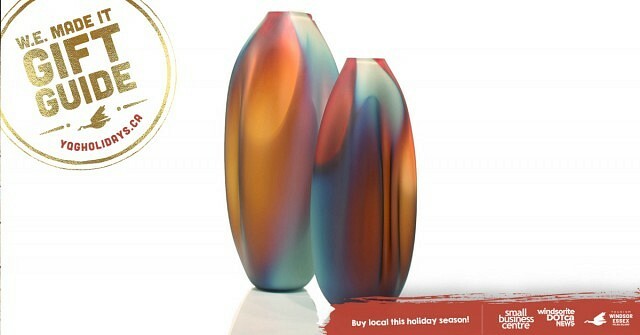 Custom feature gift: Drape, Mini 9″H, Cherry/turquoise etched; DRAPE is a sculptural hand blown glass vase that is made using the fluid nature of hot glass to show movement, capturing gentle folds as the piece cools during the glassblowing process. Want to find more ideas of locally made gifts to give this Christmas? Click yqgholidays.ca for their entire W.E. Made It Gift Guide featuring only locally made items, sponsored by the Windsor Essex Small Business Centre and Tourism Windsor Essex Pelee Island. You could also win one of the feature gifts in the W.E. Made It Gift guide. Enter today – and enter daily – for your chance to win one of our W.E .Made It featured local makers or artisans. You can enter once per day by clicking here! Sponsored by Tourism Windsor Essex Pelee Island and the W.E. Made It program, promoting local artisans and makers in Windsor Essex. For more details on the W.E. Made It program click yqgmade.ca.